Chennaites have long been fans of the Bombay Brasserie with its take on North Indian food. 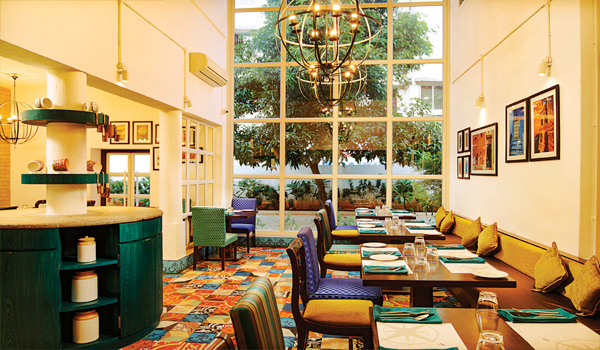 But now, the famous restaurant opens its doors in Bengaluru with a revamped look and feel. ai?? ?We wanted to take our concept and travel across the country with it,ai??? says Shikha Nath, the brand director, adding, ai?? ?Our decision to open here was influenced by our mission to offer a space that is casual and approachable and sample the flavours that our country has to offer.ai??? Hereai??i? ?s what you can expect from the menu. The small plate section is quite substantial, despite the name. All the dishes are inspired by regional Indian cuisines, but with a modern twist. Each recipe is unique and features locally sourced ingredients, Nath explains. Like the Spicy Pahadi mushrooms ai??i?? mushrooms stuffed with a special masala from Himachal Pradesh and served with herbed chilli hung yogurt. The Naga Ghost pepper wings are smoked and roasted chicken wings flavoured with the famous Bhut jolokia chillies from Nagaland. The Calcutta Club fish fry is the colonial-style British-era fish fry, which is served with the traditional kashundi mustard and a not-so-traditional grilled pineapple and mango salsa. From the mains, we recommend the Hot Plates and Street Grills section. Opt for the Lucknowi Paraath Paneer ai??i?? paneer seasoned with poppy seeds and Lucknow-style garam masala ai??i?? or the Old Delhi Murg Boti with butter roomali, which is chicken kebabs served on roomali rotis. If you, like us, prefer a South Indian twist to your plate, try the Pondicherry Fish with Masala Bread Roll ai??i?? pan-grilled fish fillets with ginger in a lemon gravy. They claim it is an ode to Pondicherryai??i? ?s French Quarter. A unique choice would be the Bombay Lunch Home Veg Curry and Banana Leaf Rice, made with seasonal vegetables cooked in special coastal spices from Mumbai, and rice steamed in banana leaves. The dessert section brings back memories of our childhood with options like the Bombay Ice Cream Sandwich. Made of Jim-Jam, Parle G, Bourbon biscuits and filled with luscious ice cream, this one is a must-try. If youai??i? ?re craving comfort food, the Anglo-Indian Bread Pudding, made the traditional way, is a good option. Located in a bustling neighbourhood, the restaurant with its strong fan following and eclectic menu, hopes to win the hearts of Bengalurians. Their next step is to set up shop in Pune and Mumbai.